Finding the best gifts for organic gardeners can be really tough, especially if you’re not familiar with organic gardening! Don’t worry, I’ve got you covered! 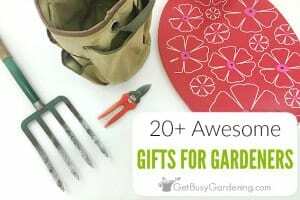 You’re sure to get lots of ideas for the perfect presents for them on this list of organic gardening gifts! Organic gardening is not only better for the environment, it’s better for the gardener as well. The exposure to chemicals can be very harmful to our heath and to our gardens too. That’s why so many gardeners are passionate about using organic methods, and applying only natural gardening products. But buying gifts for organic gardeners can be a real challenge, right!? 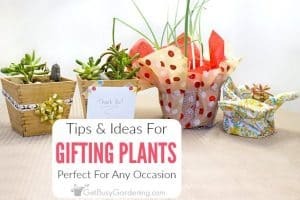 So, if you have an organic gardener on your list to buy gifts for holidays like Christmas, Mother’s or Father’s Day, birthday ideas for gardeners, or even a housewarming gift, then this organic gardening gifts list is for you! 1. 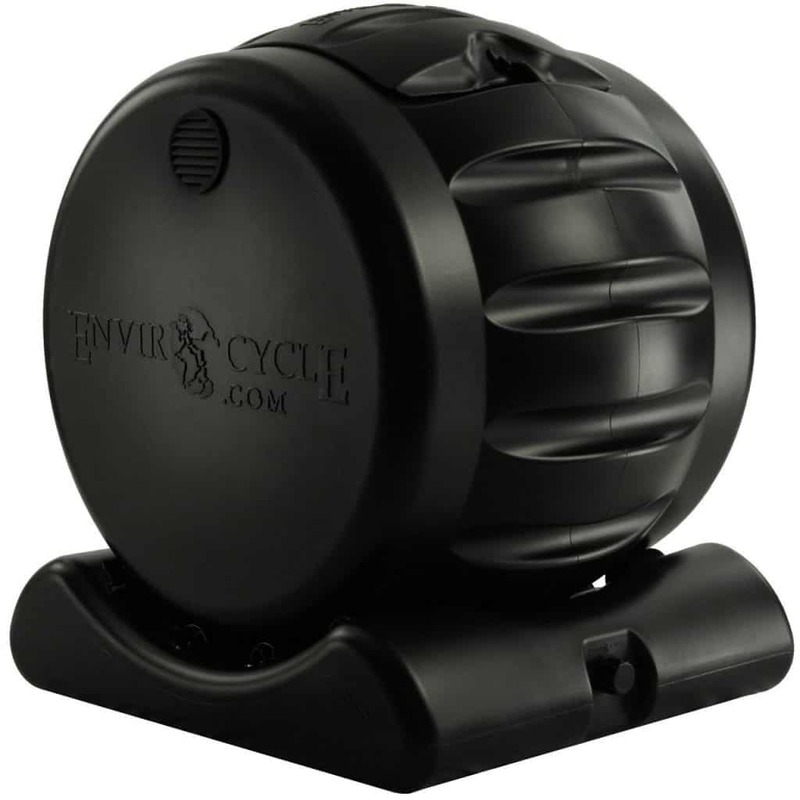 Compost Tumbler Bin – Compost is an important part of organic gardening, that’s why we call it black gold! It’s natures fertilizer, and helps replenish the nutrients the soil needs to continue to produce delicious organic fruits and vegetables. Anyone who gardens organically absolutely needs a compost bin. This one is super easy to use, and makes both compost and compost tea! 2. 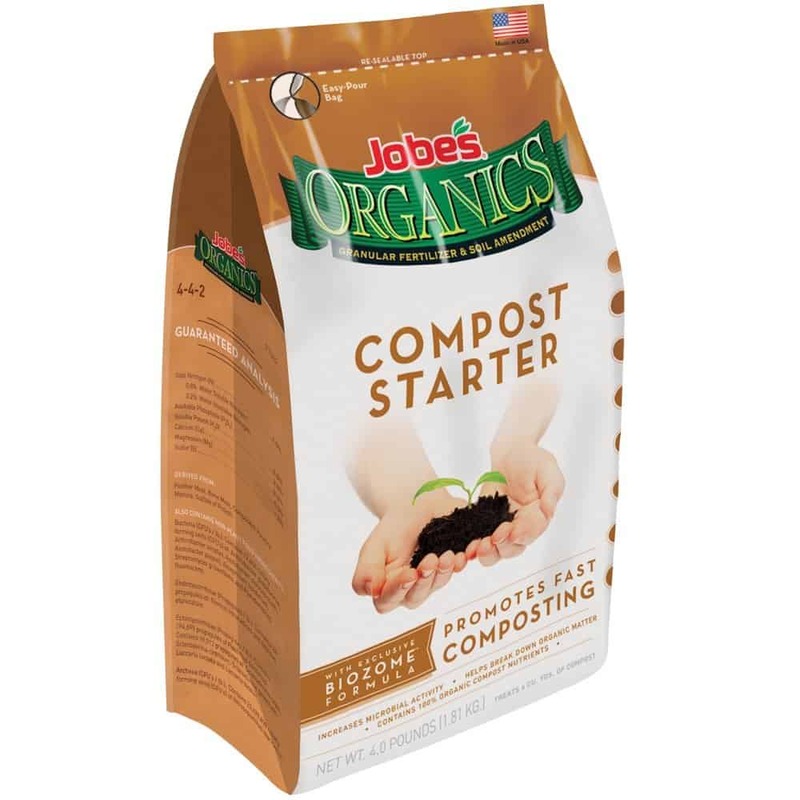 Compost Starter – Compost starter contains natural microorganisms that help to start, and also to speed up the composting process. It’s the perfect gift for the organic gardener who is just getting started with composting, or anyone who is an avid composter! 3. 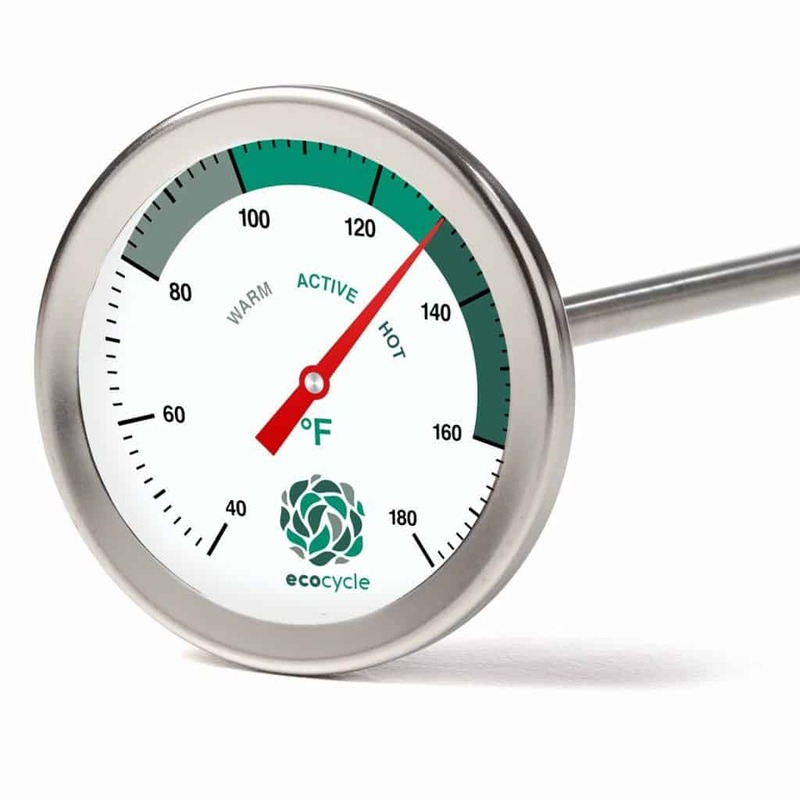 Backyard Compost Thermometer – Heat is super important for the success of backyard composting, so a compost thermometer is an excellent gift to get an organic gardener. This one has a nice long stem (20 inches), and an easy to read temperature gauge that goes from 40F to 180F. The dial is color coded and fog resistant, and the whole device is waterproof and durable. 4. 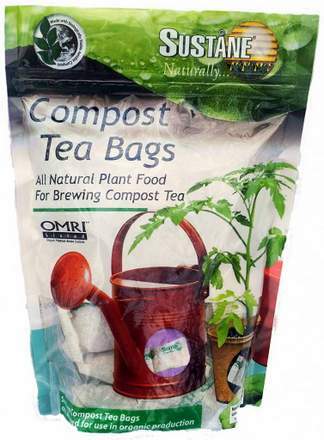 Compost Tea Bags – One of the best organic fertilizers to use on plants is liquid compost tea. Liquid compost provides many essential nutrients to plants, and helps build the microbial populations in the soil too. These tea bags contain all natural compost, and make it super easy for gardeners to brew their own all natural plant food! 5. Kitchen Compost Pail – Most gardeners use an ugly plastic bucket to collect their kitchen waste for composting, so this cute metal bucket would be a very thoughtful gift. 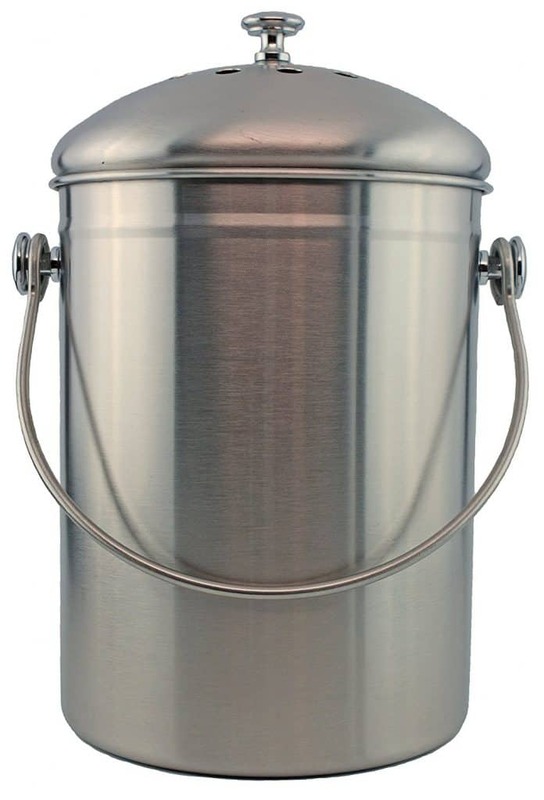 This 1 gallon pail contains a carbon filter that helps to control odors. The outside has a very attractive stainless steel finish meaning that keeping the compost bucket in the kitchen won’t be an eyesore. Plus the heavy-duty handle makes it easy to carry it out to the compost heap. 6. 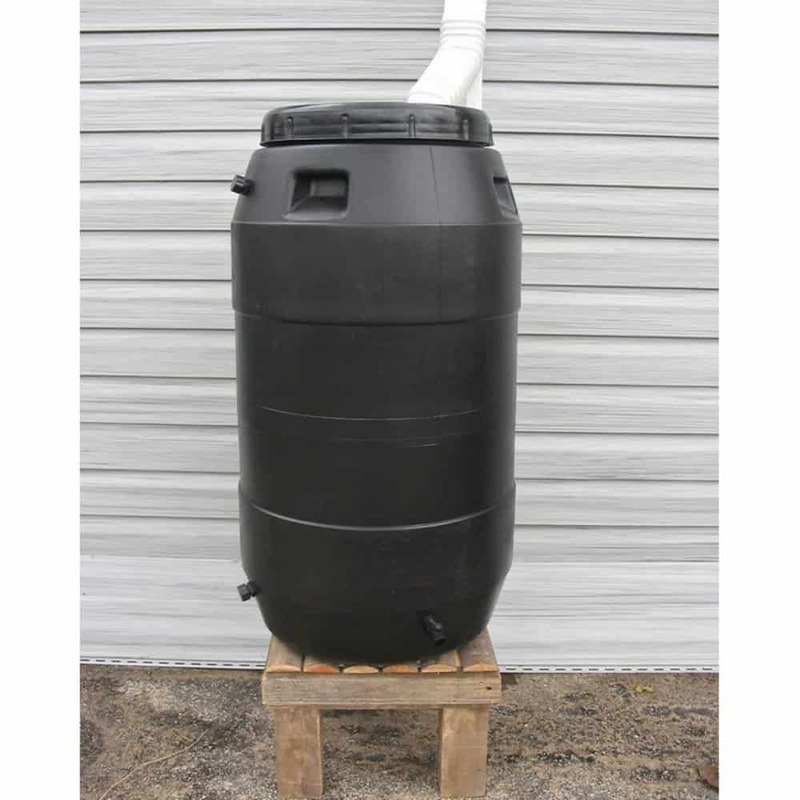 Rain Barrel – The best type of water to use on plants is rainwater, and every organic gardener should have a rain barrel. It’s super easy to hook this one up to the gutter, and they can start collecting rainwater for their garden right away! The spout at the bottom will attach to a standard garden hose to make watering plants or filling a watering can easy. 7. Worm Composting System – If you’re looking for a unique gift ideas for organic gardeners, then this worm factory would be the ultimate! With this system, worm composting can be done anywhere – indoors or out! 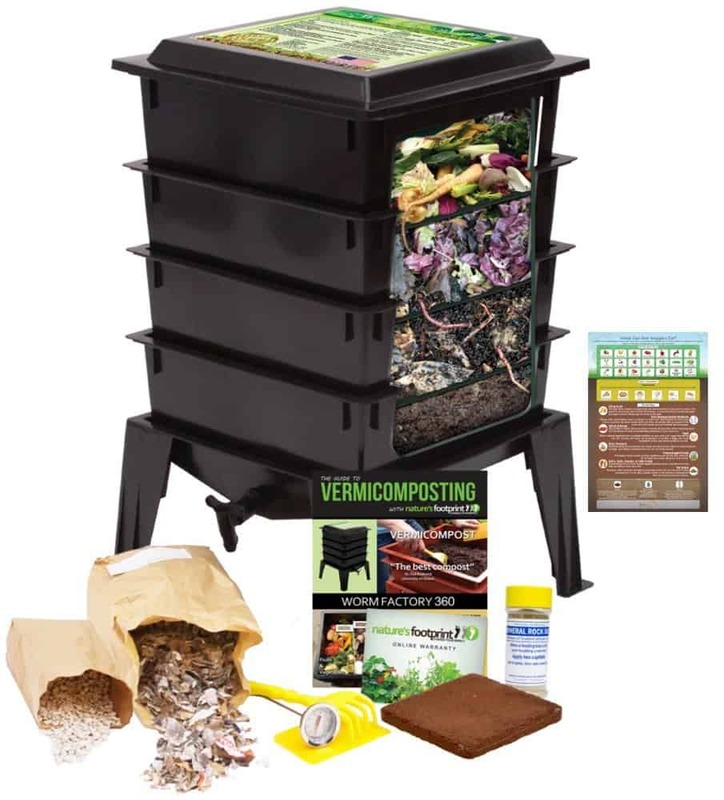 This self-contained composting factory is the real deal, and comes with everything they need to get started with worm composting (except for the worms), including full instructions! 8. 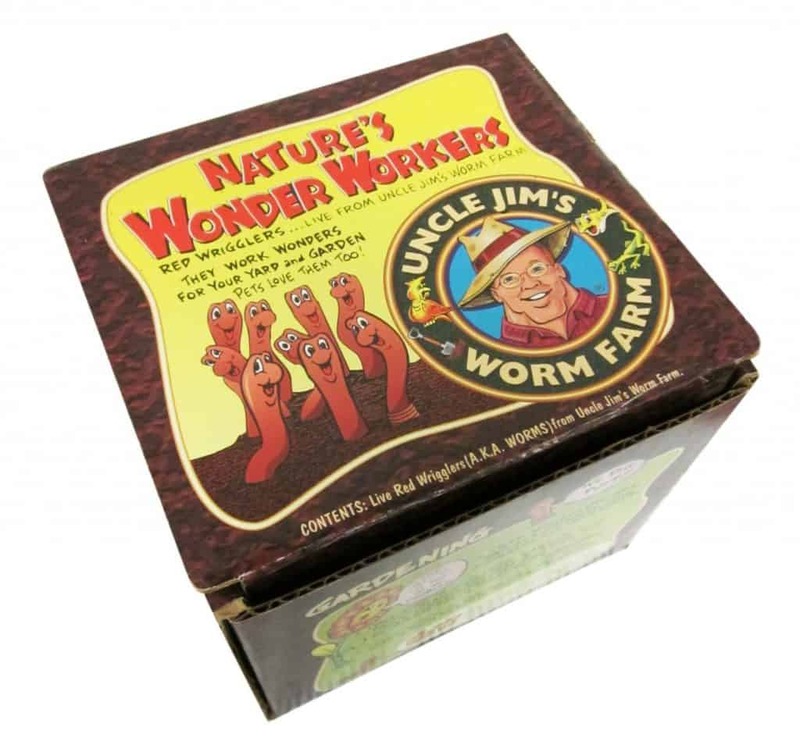 Worm Farm Worms – Worms may seem like an unusual gift idea, but trust me, worms are fantastic gifts for the organic gardener! They are an important part of making sure that garden soil is healthy, and an essential addition to any composting system (especially a worm farm!). When worms are present, plants are healthier and roots are stronger. 9. 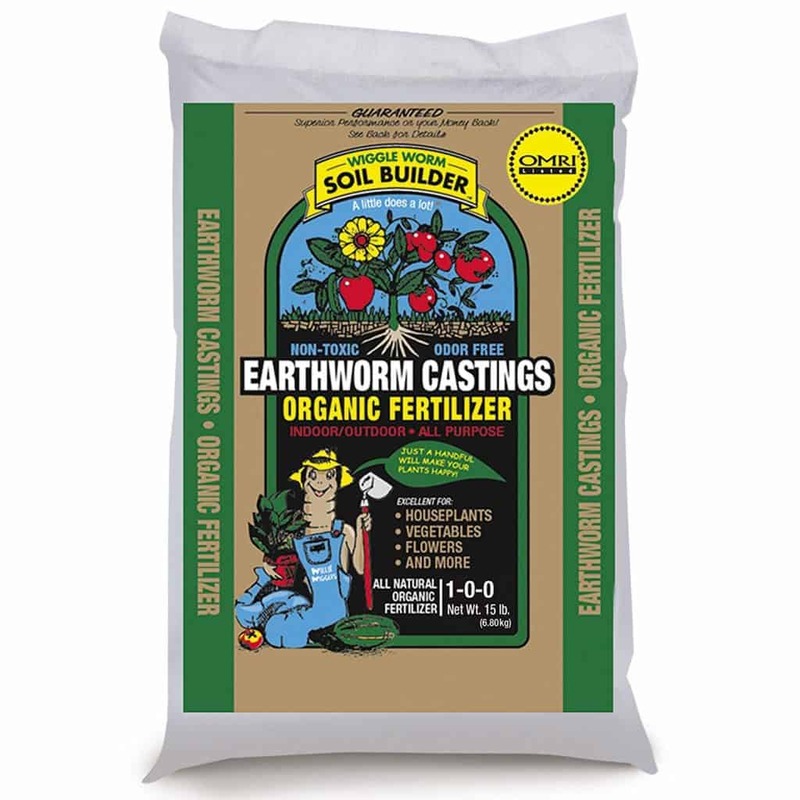 Earthworm Castings – Worm castings are an excellent, and all-natural plant food! There’s nothing more natural than using earthworm castings (aka worm poop) as fertilizer. This organic fertilizer is odor-free and non-toxic, and can be used indoors or outdoors, for anything from houseplants to vegetables. 10. Fish Emulsion – Plants love fish emulsion, and it’s an excellent organic fertilizer! Using this fish and seaweed blend to fertilize plants will help to increase the amount of fruits and vegetables that plants produce, and also helps to produce strong, more beautiful flowers. Plus it works great to give seedlings a growing boost too! 11. 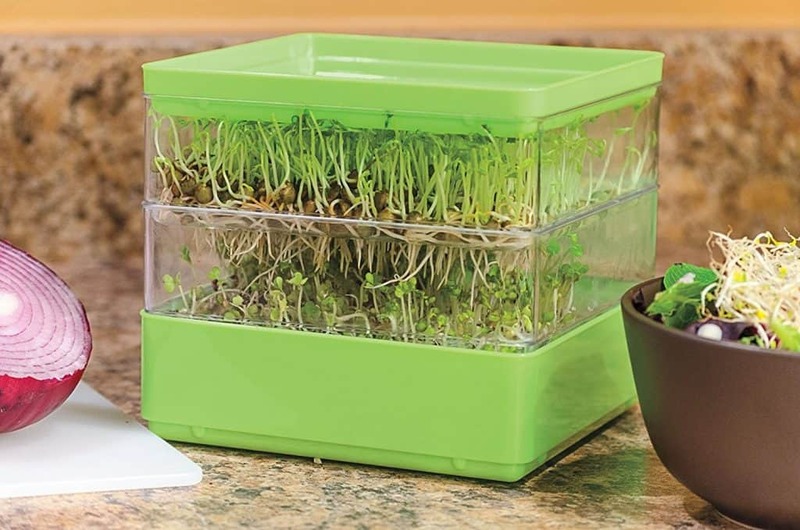 Seed Sprouter – Growing organic sprouts is super easy with this sprouter, and they can be grown year round right on the kitchen counter! This is an excellent gift for any gardener, but especially for those who want to start growing food indoors! Be sure to also get them some organic sprouting seeds so they can try it out right away! 12. Mason Bee Hive – Bees are an important part of organic gardening, and everyone want to help save them! Mason bees are a non-stinging variety known for being amazing pollinators. 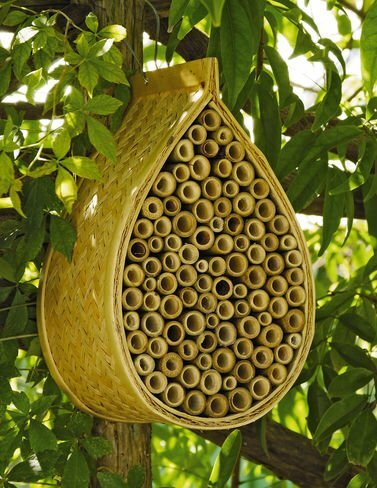 This bee house is made of natural bamboo, and provides a safe place for mason bees to call home. Make it a gardening gift set by including some mason bee house attractant and a book about mason bees and gardening. 13. 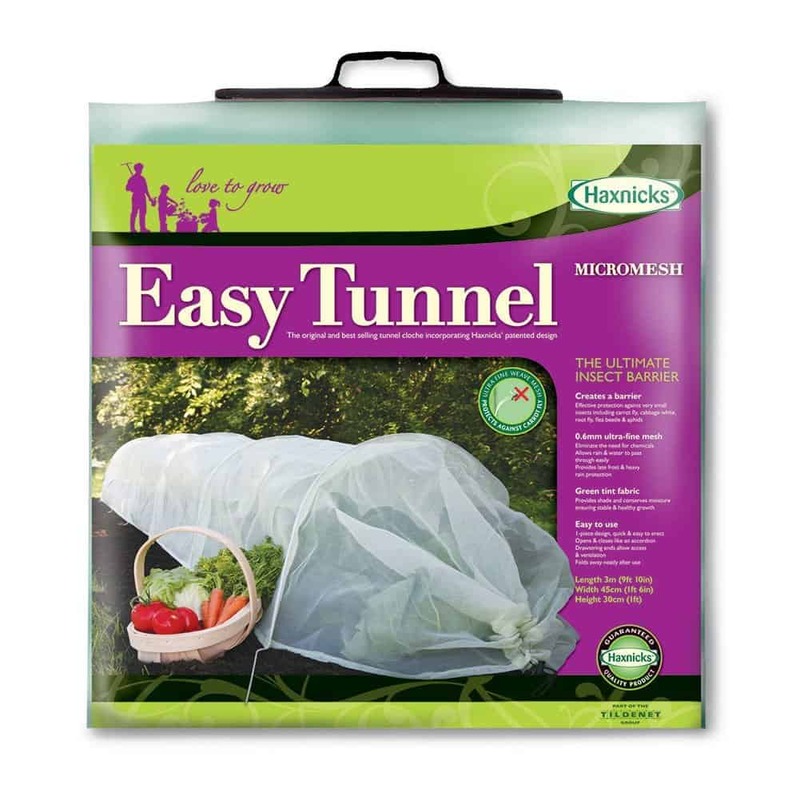 Micromesh Floating Row Covers – Floating row covers are excellent gifts for people who garden organically. Rather than spraying plants with insecticides, gardeners can use these row covers as a physical barrier to protect plants from harmful bugs. They also work great in the spring and fall to keep frost from ruining sensitive plants. They’re very lightweight so the air and water can still get in, but the bugs can’t. 14. Soil Testing Kit – A healthy and productive garden starts with good soil. Gardeners need to test their soil regularly to ensure it’s got all of the nutrients needed for plants to thrive. This inexpensive kit will allow them to test all the important components in their soil right at home. 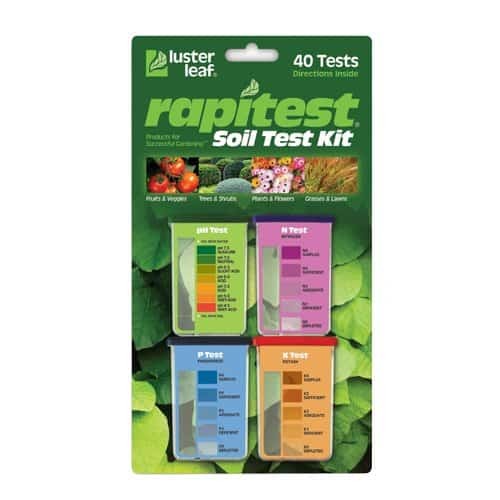 The soil test kit comes with detailed instructions and a tips for improving garden soil. 15. 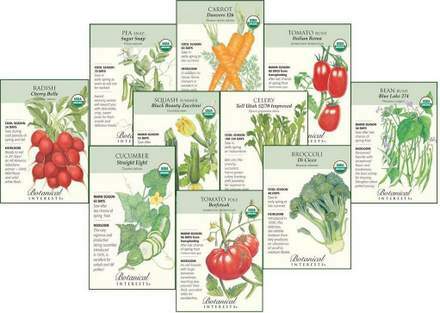 Organic Garden Vegetable Seeds – This set of 10 seed packets contains seeds for a basic vegetable garden. The seeds that come in the package are: beefsteak tomatoes, broccoli, beans, cucumber, radishes, sugar snap peas, carrots, and roma tomatoes. Organic seeds are fantastic gifts for organic gardeners, and we need new seeds every year! 16. 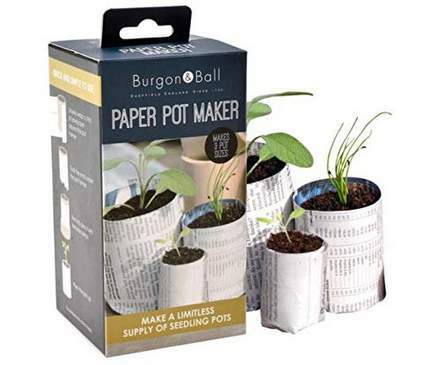 Paper Plant Pot Maker – Making paper pots for seed starting or potting up seedlings is a great way to be eco-friendly and upcycle trash! Since the pots will be biodegradable, they can plant them right into the garden without the risk of damaging delicate seedlings. This paper pot maker is fun and easy to use, and can be used to make 3 different sized paper pots. 17. Stand Up Weeding Tool – Weeding is a necessary evil for organic gardeners, so why not get them a tool that makes it much easier (and saves their back!). This stand up weeder is ideal for permanently removing tough weeds from the garden or the lawn. 18. Diatomaceous Earth – If you’re not a gardener, then you may be wondering what this is. 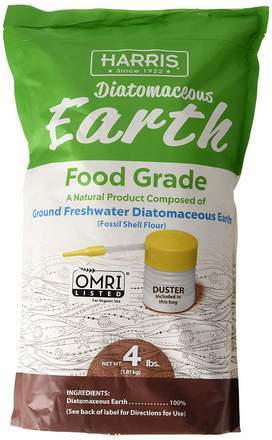 Diatomaceous Earth (DE) is an all-natural product that works great to get rid of pest insects in the garden. It’s essential for organic gardeners! This one includes a duster (a tool they can use to make spreading the DE much easier). Otherwise, you could buy the duster separately to give as a gift by itself. 19. Birdhouses – Birdhouses make the best gardening gifts because, not only are they super cute, they’re great for organic garden pest control! Birds are wonderful predators that feed on the caterpillars, beetles and other bad bugs that attack garden plants. 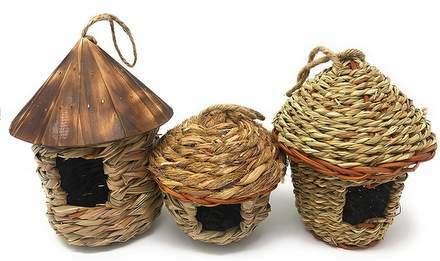 This set of three is adorable, and they’re made out of all-natural materials. 20. Garden Spading Fork – Spading forks are really nice garden tools that can be used for so many things, like turning the compost pile, laying mulch, digging up plants and weeds, and spreading leaves in the fall. It’s a very useful gardening gift, and a tool that many gardeners don’t already have. It can be really hard to find good gifts for organic gardeners, especially when you’re not a gardener yourself. 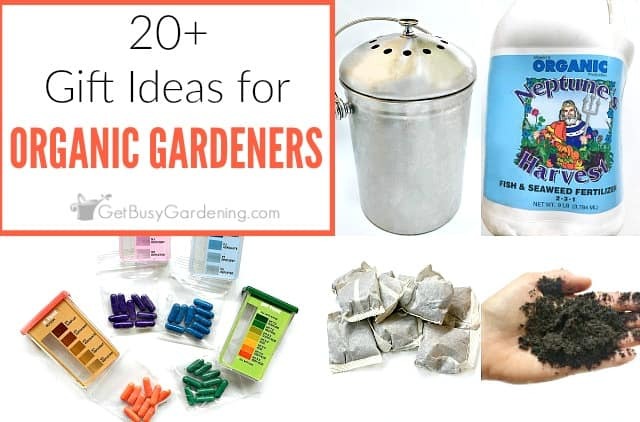 I hope this list has helped to figure out what to get a gardener who grows organically! 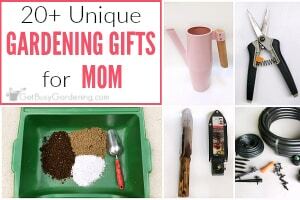 But if you didn’t find anything on this organic gardening gifts list that you like, don’t worry! I have a ton of other ideas for you. 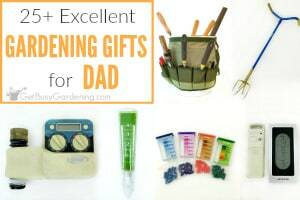 Check out my other gardening gift guides…. Share your favorite gifts for organic gardeners in the comments section below!